Earlier installments of this con report include Part I - Before and Part II - Friday. Parts IV and V are forthcoming. Saturday morning we left the house before 8AM so we could get down to the Hollywood district by 8:30. 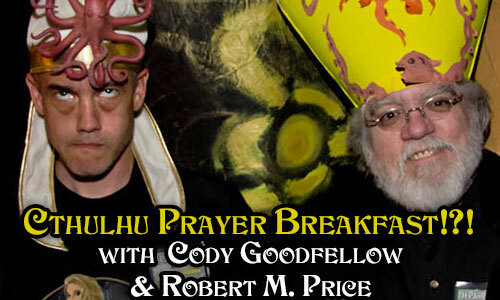 Robert Price, who in addition to being one of two performers at the Cthulhu Prayer Breakfast is also a very close personal friend of Joe Pulver, warned us these events always fill up, and we shouldn't arrive late. The problem with arriving at 8:30 is that Columbia River Brewing (yes, the same place we'd been eating most of our lunches and dinners so far) didn't even open until 9AM, a minute or two before the event was supposed to start. So a bunch of Lovecraftian weirdos gathered out on the sidewalk, waiting, scaring the neighbors, and causing a general decline in property values. I checked my phone, thinking I'd answer the text messages Alicia Graves left last night. I found there were also missed calls from Scott Nicolay, a writer friend of ours from New Mexico who had really hoped to be able to attend this year's event, but hadn't been able to come. Scott knows Alicia, and had been texting back and forth with her all along. I figured maybe when she'd been unable to reach us last night, she might have asked him to try to reach us. Hmm... the mystery deepens? Still too early to call Scott back. Finally, we got inside, and snagged a table. 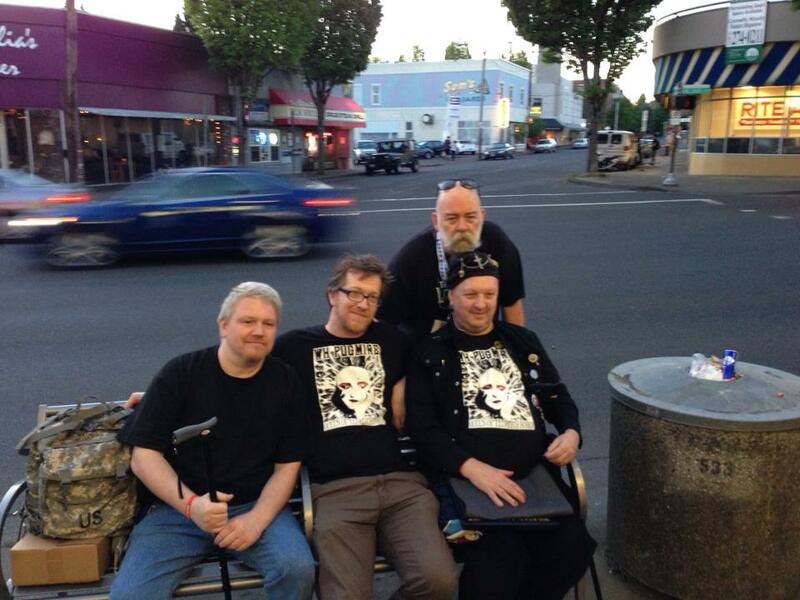 We guessed where Robert Price and Cody Goodfellow would be setting up, and sat nearby. We guessed wrong! 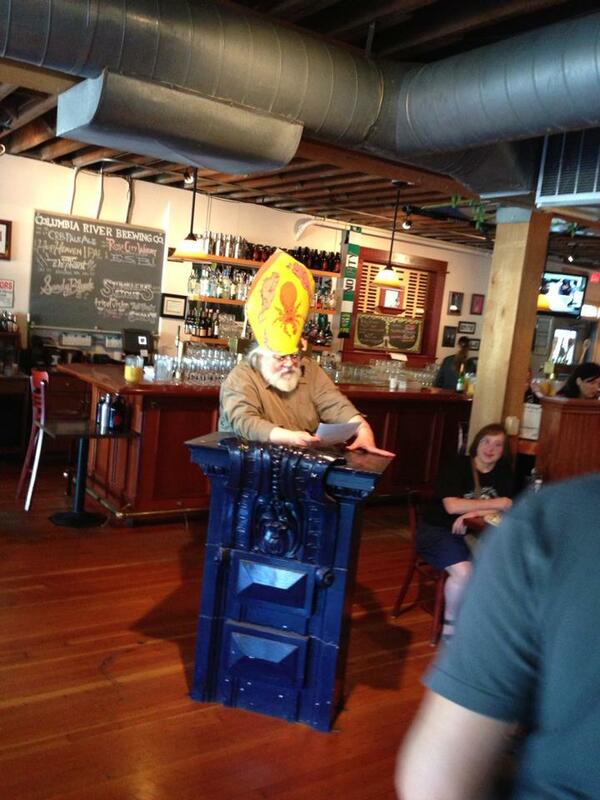 Their "pulpit" was actually the hostess station at the front of the restaurant. We ended up sitting behind the action, hence the weird angle on some of the photos I posted. The breakfast aspect of the event was straightforward -- eggs and potatoes and bacon and little pancakes served banquet style. Ross Lockhart and I both take a lot of iPhone photos, and constantly quick-post them to Facebook while the event is still happening, to a degree that either delights or infuriates everyone around us, depending on whether or not they're cool. Ross and I joked that we could both view the same events from a very slightly different angle, in very nearly real time, by checking in with each other's photo feeds. On the next table, woodcut artist Liv Rainey-Smith. 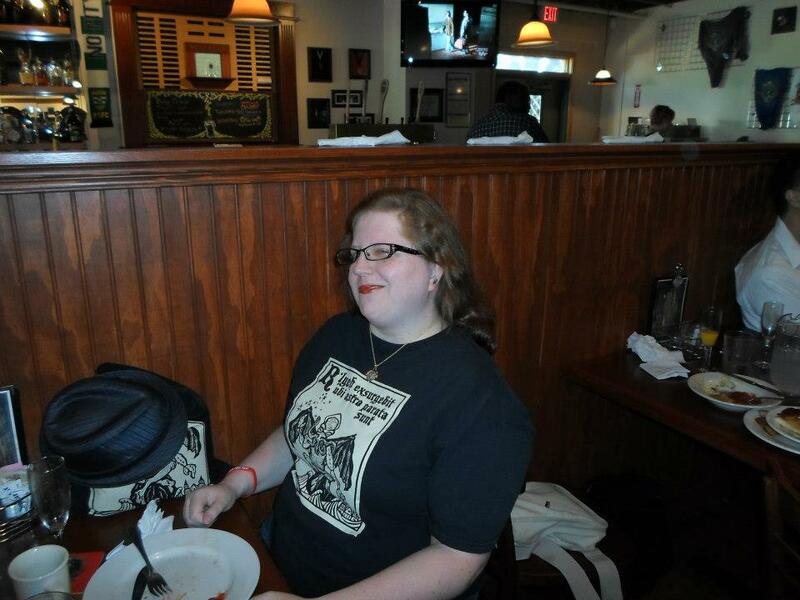 You can see an example of Liv's woodcut art on her t-shirt here. I ended up buying myself one of these shirts, but not until the future. See, at the time I'm writing this blog post, I'm looking back on the past event of the shirt purchase, but as of the morning here depicted, Liv had a shirt like this, but I didn't yet. I realize this is complicated, like trying to unravel Primer or Memento or something. Just trust me. You'll see the shirt -- my shirt -- in Part IV. Here's a photo for those of you disinclined to watch moving pictures, or may be reading this in a workplace that can't deal with crazy, pseudo-religious shouting. 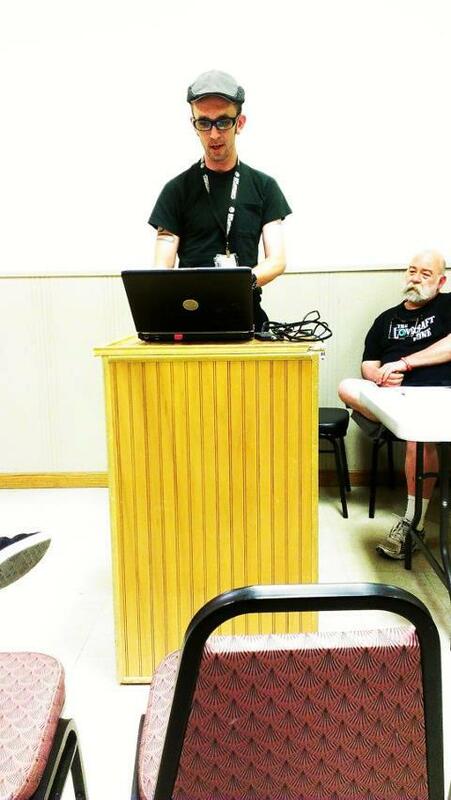 After Cody's portion, writer and editor Robert M. Price came on like a Cthulhu-flavored Southern Baptist preacher. 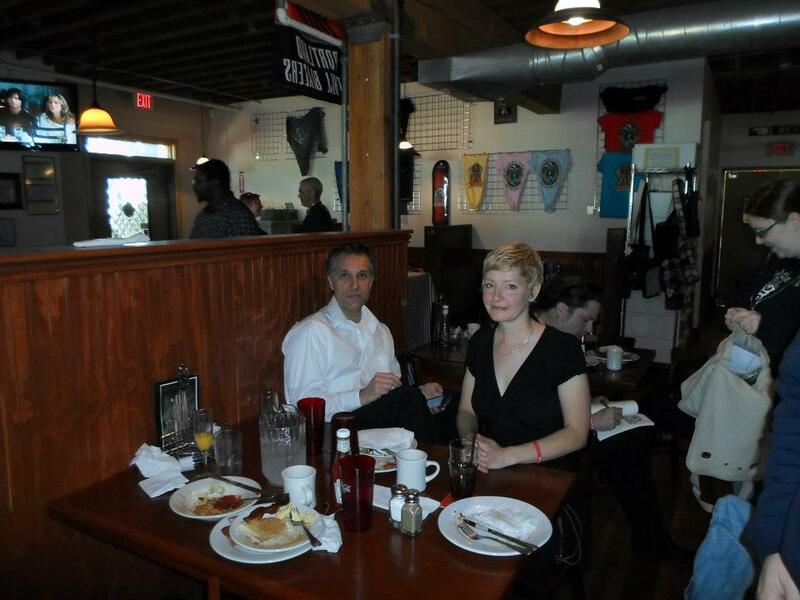 This event really was a lot of fun, and had the restaurant full of about 140 people rocking. The first event we wanted to see was Pickman's Apprentice, which is the contest in which artists try to create a piece of art in real time based on key words provided by the audience. Last year, we watched Nick Gucker, Lee Moyer and Mike Dubisch spend two hours rendering a shoggoth in a circus. This year, the same three artists, plus Liv Rainey-Smith (see above, woodcut artist, t-shirt, et cetera) tackled the challenge of depicting the King in Yellow (guess which audience member shouted that out?) in a sushi bar. I didn't get any good photos of the challenge this year. Lena and I needed to leave before 1PM for the funeral. Before that, I went out to the main upstairs landing, aka the "Mall of Cthulhu" where vendors sell their Lovecraftian wares. I was trying to find Joe, who had two packages I needed to mail while we were out. 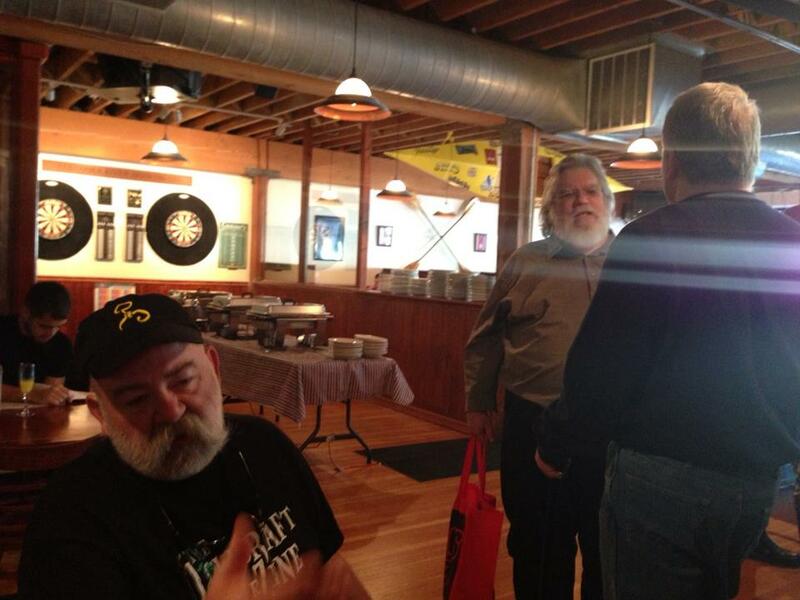 When I found Joe and Mike Davis, they pointed at the opposite end of the upstairs, and asked, "Did you see Scott yet?" I turned and looked where they were pointing. There was a guy over there who looked like Scott Nicolay, sort of. I figured they were kidding, because an ongoing joke all weekend had been how badly Scott wanted to be here, and couldn't make it. We kept teasing Scott, who wanted to meet Alicia in person, that we were hanging around with her, and too bad he couldn't be here! Turned out, it really was Scott. He really had shown up, surprised everyone. In fact, that was the surprise that was supposed to happen the night before. Scott had arrived late, and Alicia had brought him down to shock everybody... but we were already heading toward sleep. We came back and changed into more comfortable clothes in the car. 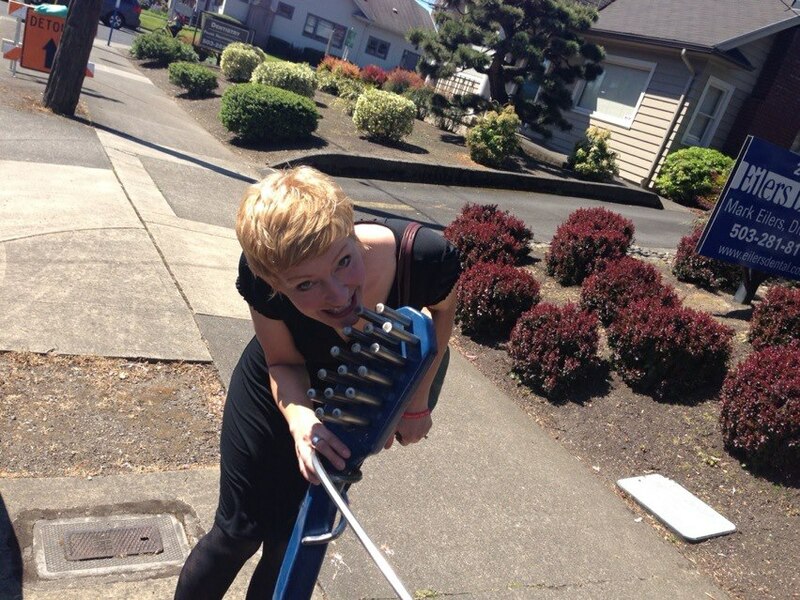 Nearby, we found a pair of dentist's offices with giant metal toothbrush sculptures embedded into the sidewalk out front, so Lena took a moment to freshen up her dental hygeine. I was glad to see the room in which my own Sunday reading would take place, off-site in a place called "EOD Center" a block from the theater, next door to Columbia River Brewing. The room, essentially a mid-sized classroom with room for plenty of chairs, was walled on one side by a sliding vinyl partition. On the other side of that was an open area full of vocal, enthusiastic gamers. The amount of chatter audible through the partition wasn't really a problem, at least it wasn't loud enough to prevent the audience from enjoying the reading, but I was glad to know in advance that I'd need to speak up, and could expect distractions from the next room. 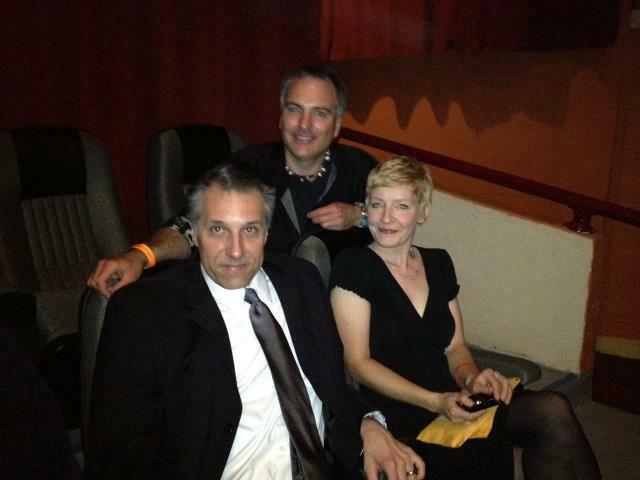 After the Pulver-Goodfellow-Morris reading, we returned to the theater. 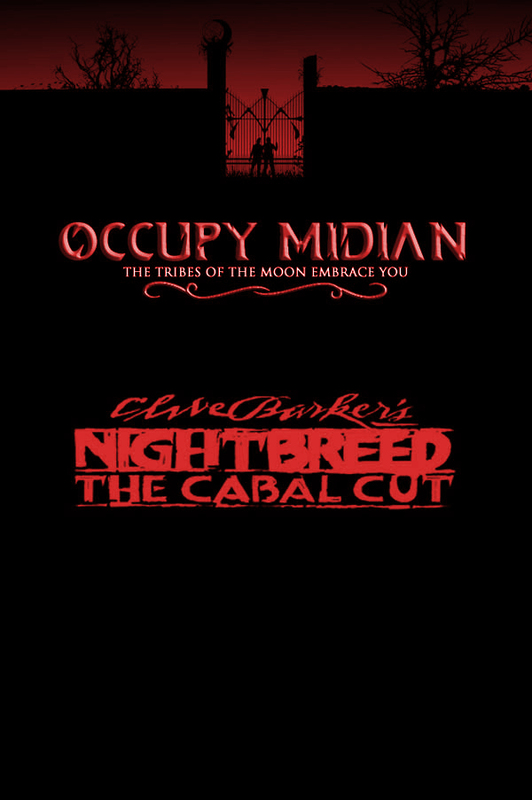 We were too late to watch Nightbreed: Cabal Cut, which had started an hour earlier. This is a restored version of Clive Barker's poorly-received 1990 horror/fantasy film. The restoration was accomplished utilizing material from VHS rough cuts, and while my understanding is that the Cabal Cut greatly improves the story's impact and coherence, the quality of the restored materials does not match that of the original. It's been suggested that eventually a fully-restored Cabal Cut, going back to original camera negatives or at least first-quality optical materials, may be released on DVD or BluRay. I hope so, as we had to miss this screening. Here's the official H.P. 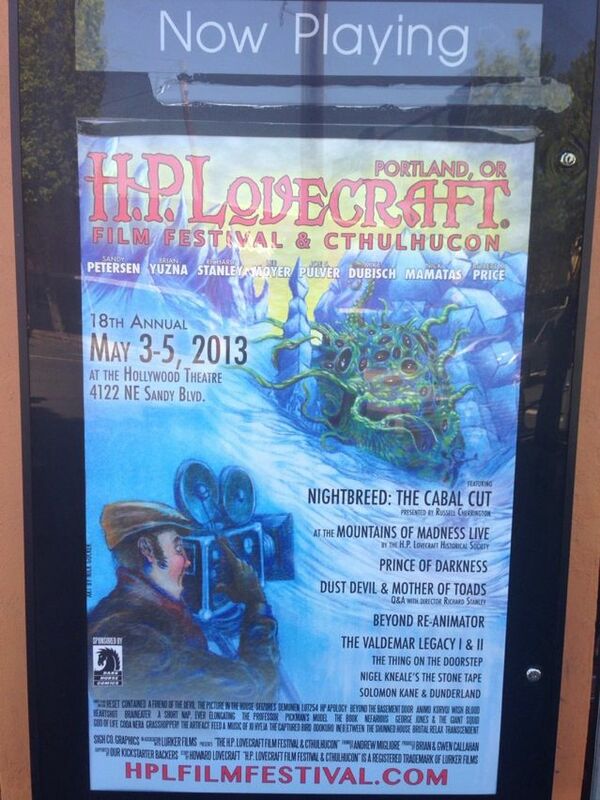 Lovecraft Film Festival poster, featuring artwork by the great and wonderful Nick "The Hat" Gucker. 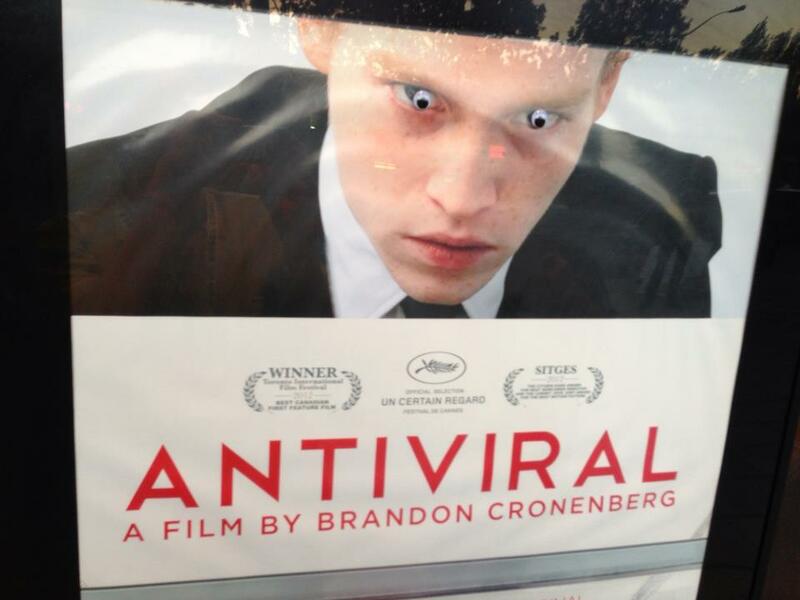 For a while, this had googly eyes all over it, but by the time I took my picture, the poster had been de-googly-ed. Because all events were mid-stream, we went back upstairs, to the vendor area. 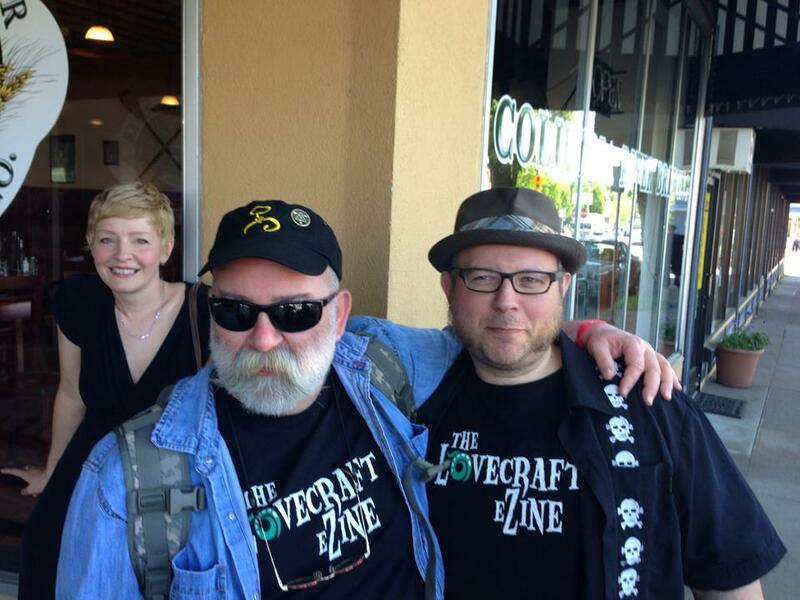 Lena and I bought t-shirts, then talked for a while with Nikki Guerlain, a Portland area writer. I asked about Nikki's son, as she had mentioned on Facebook the possibility of bringing him to the festival. This led to Lena and I mentioning not having kids, which led to Nikki freaking out about how much younger Lena looks than her age, and this led finally to Nikki revealing her age and both Lena and I freaking out about how much younger she looks. Nikki and Lena compared notes about many subjects relating to diet, health and nutrition, the various keys to looking 10-15 years younger than their actual ages. Then Nikki and I spent a while talking about writing and publishing, about moving from one genre to another, about the benefits and drawbacks of critique groups. We both had stories appear in Phantasmagorium weekly, and both have stories upcoming in Mighty in Sorrow, the Current 93 tribute edited by Jordan Krall. In fact, several others present at the HPLFF will be included as well, such as Ross Lockhart and Joe Pulver -- possibly others I'm forgetting. 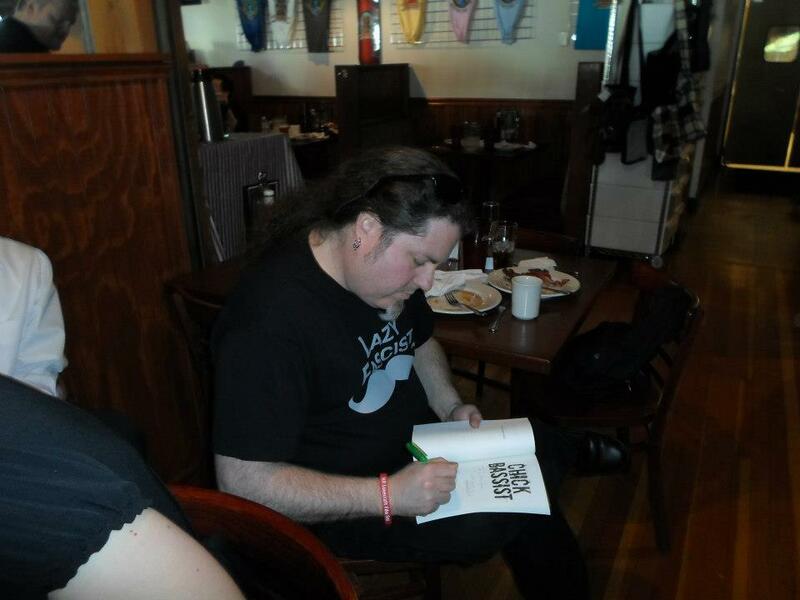 That book will be released at NecronomiCon, another Lovecraft festival happening in Providence, Rhode Island (Lovecraft's home town) in August. Nikki is fun, super-energized, and overflowing with ideas. She talks as fast as anyone I've ever known! 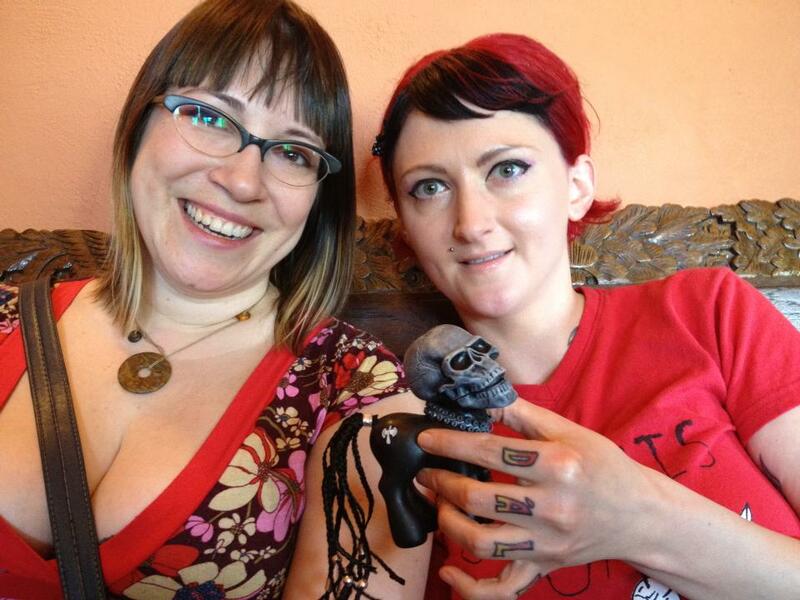 Here's Nikki (r) with Alicia Graves (l). Nikki gave me a copy of Imperial Youth Review, a new literary zine in which she had a story, as did Edward Morris and Nick Mamatas -- and Nick Gucker had an illustration and Jess Gulbranson a review -- to name only HPLFF guests. The second issue will have a Joe Pulver story. Sam also debuted a W.H. Pugmire t-shirt design, with art by Nick Gucker, in honor of Wilum's birthday. Wilum seemed very excited and proud of the shirt, and everybody seemed to want one. Pretty fabulous! In the above picture, that's Sam sitting next to Wilum Pugmire (both of them wearing the new W.H. 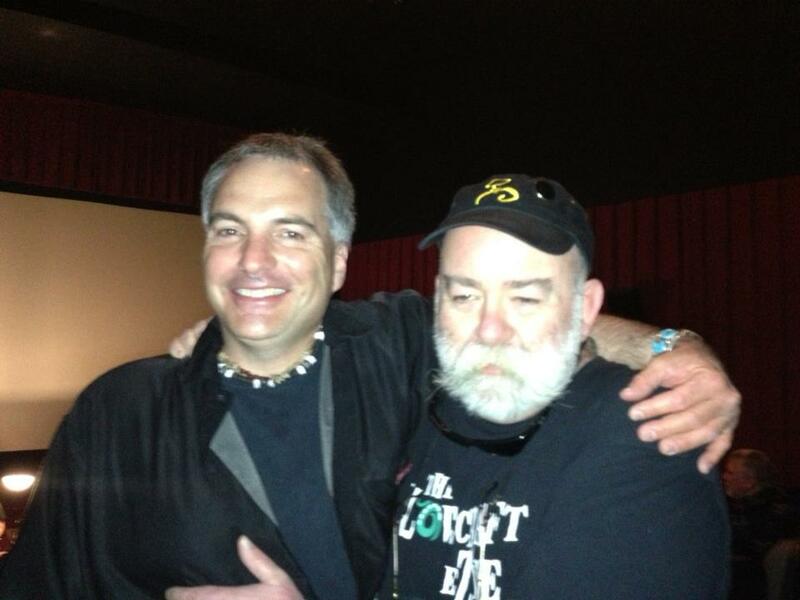 Pugmire t-shirt, and Mike Davis, with Joe Pulver behind. 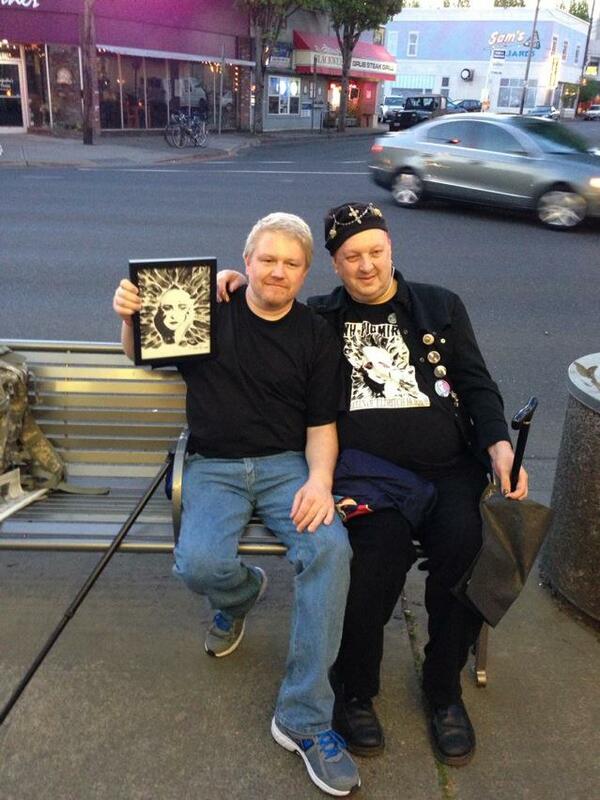 In the following picture, here's Mike Davis showing off the artwork for the Pugmire t-shirt, with Wilum himself. 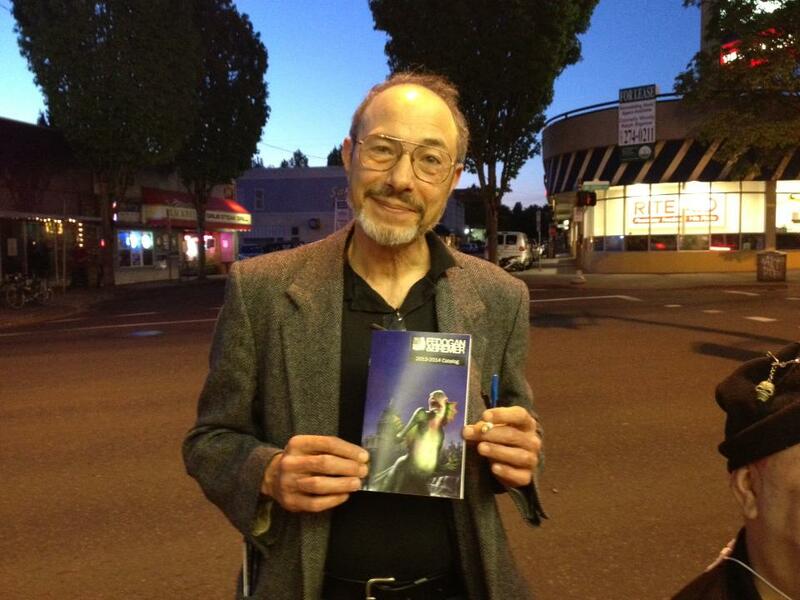 We met Dennis Weiler of publisher Fedogan & Bremer. They're best known for Lovecraftian anthologies, but soon will publish Scott Nicolay's debut collection Tuckahoe. I got my hands on the catalog Dennis is holding in the picture, and it looks like F&B has some interesting things coming up. After the dinner break (we ate again at Columbia River Brewing -- where else?). On our return to the theater, we considered watching the "At the Mountains of Madness Live on Stage" performance. We later heard this was really good, and wished we hadn't missed it. Because we had skipped the after-party the night before, and didn't need to get up early Sunday morning, we all planned to go to the after-party Saturday night. We also thought if we waited until 11, Tony Starlight's would be packed, so we had what we considered a clever idea to skip the 9-11PM movie block and go to Tony Starlight's at 9PM. Mike Davis had told Molly Tanzer we'd see her there, and Joe had said the same to Kelly Young and Brandi Jording (who were off having another nap). We tried calling and texting everyone to let them know we were headed over early. The problem was, the door person at Tony Starlight's told us there was a $16 cover, and anyway they didn't want any Lovecraftians in the place until 11PM. Joe had been claiming all weekend he'd drink a Scotch if somebody would buy him a good one -- it had to be at least a 12-year-old single malt -- which was noteworthy because, despite the bEast behaving in a way that might make some guess he's intoxicated, he hadn't actually had a drink in something like 15 years. 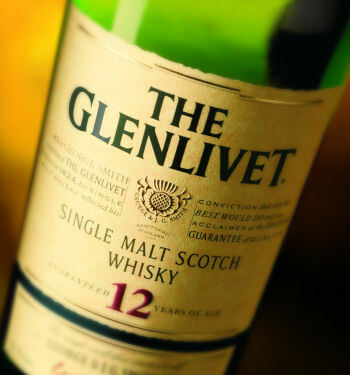 I bought a 12-year Glenlivet for him, and one for myself. While we sipped, I was lucky enough to listen in while Joe discussed a couple of anthology ideas with Ross Lockhart for Ross's new publishing venture, Word Horde. It was interesting to listen to their back-and-forth, weighing possibilities and trying to determine which angles might be compelling. Overall, it sounded very much like the kind of discussion I've had many times, considering projects for my Hypnos record label. There seems so much overlap between music and literature, and I never stop being surprised how many of the lessons I learned running a label, and dealing with recording artists, translate directly to situations in the writing and publishing world. Before we left, Alicia mentioned that Scott Nicolay would be leaving early the next morning, and this was the last we'd see him. It was great to meet this good friend in the flesh. Too soon, he had to return home. The one thing that made it easier for everyone, saying goodbye, was that so many of us are planning to attend NecronomiCon in Providence, this coming August.